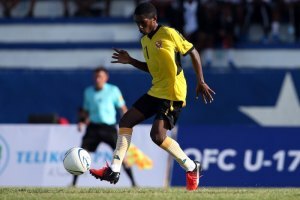 Papua New Guinea youth international Emmanuel Simongi who arrived back home yesterday, has taken another huge step in his development as a footballer. Simongi is one of four student-athletes who have returned for a second year at the OFC Education Centre in New Zealand, spend a week in Brisbane last week for a trial with Brisbane Roar Academy. Accompanied by his coach-mentor Phillip Pickering-Parker to the trial said Emmanuel was in training with the Brisbane Roar A-league Youth team and has grown everyday in the high performance environment. Parker said Emmanuel has completed the trial and will await feedback from the head coach, Jason Robinson with Academy Director, Drew Sherman on Emmanuel’s performance throughout the week. “He continues to be life educated each day with ‘Big Dreaming’ tests I put in place for him and he is an excellent ambassador for the PNGFA and OFC including his family,” says Parker. and he has enjoyed the experience. He said the time that he spends at OFC Education Centre had taught him a lot which he also gains more confidence. “I was glad to be invited for the trial and hope that I will secure a spot next year at the Brisbane Roar Academy,” said Simongi.